Paul has been the Managing Partner of Edward Fail, Bradshaw & Waterson for the last 9 years and has worked at the firm for over 25 years. He is a former President of the London Criminal Courts Solicitors’ Association, and in 2011 he was appointed by the Lord Chancellor to be a member of the Criminal Procedure Rules Committee, which is responsible for drafting the criminal procedure rules. His appointment has just been extended by a further 4 years. In 2015 Paul was awarded a Legal Aid Lawyer of the Year award from the Legal Aid Practitioners’ Group for his tireless work, along with others, to campaign against legal aid reforms and cuts. He was also made a London Criminal Courts Solicitors’ Association life member as an acknowledgement of the huge contributions he has made on behalf of the profession. Paul brings over 25 years experience to his caseload, with particular expertise in murder, manslaughter, terrorism and all aspects of serious and organised crime. Additionally, he is regarded as an expert for the work that he carries out for suspects who are on bail but have not yet been charged, in persuading the police not to proceed with prosecutions. He also represented a number of clients in the recent, high-profile Hillsborough Inquiry. Paul can boast an expressive list of high-profile successes. Paul is highly respected for his boundless energy and fearless commitment to his clients. His combination of old-fashioned values and modern working practices means he is much sought after and highly regarded. He has been recognised in the last few years by Chambers & Partners Guide to the UK Legal Profession for his outstanding work. 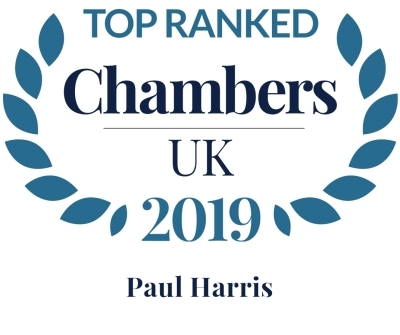 Paul Harris is held out as a leading serious crime practitioner who draws particular praise for his "incredible commitment" to legal aid work. One source states: "He inspires great confidence by combining a practical, user-friendly approach with a wealth of experience, sound judgement, technical expertise and tactical nous"
The "absolutely fantastic" Paul Harris is applauded for the quality of his client care during serious criminal proceedings. Peers say: "He has a down-to-earth approach which is very good when dealing with a range of cases. He has got very high standards, and his reliability as an advocate and communicator is great." The "very prominent" Paul Harris is "extraordinarily hard working, diligent, focused and not fazed by the seriousness of the case," according to sources. He has experience advising on serious firearm and drug supply cases. Community Protection Notices: should crying be criminal?